Take a bowl. Add dhokla flour, curd and water as per the need (the batter should be of thick consistency) and soak it for fermentation for about 8-10 hours. If it is winter it will take some more time. Add salt, 2 teaspoon oil, turmeric powder and mix it well. Use a steamer to steam dhoklas. Take 1/3rd batter in a bowl. Add 1 teaspoon of baking soda, 2-3 teaspoon of warm water, and mix it properly. Adding baking soda to every portion of mixture to be steamed helps the dhoklas to raise it properly and make it soft. Grease the thali with oil and pour the batter and spread it evenly. Sprinkle some red chilly powder and put it in the steamer to steam it for 10-12 minutes or till it is done. To check it, insert the knife and if it comes out clean, it is done. Let it cool for some time. Same way, steam other two batches of dhoklas. Cut it into diamond shapes. Serve it hot with green chutney and garlic chutney. 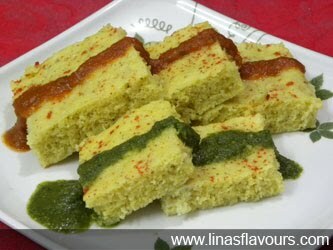 You can use ready made dhokla flour which you get in the store. Or you can make it at home. Take 1 cup of rice, ¼ cup of Bengal gram, 4 teaspoon urad dal. Soak it for 3-4 hours, mix it in the mixer and leave it for 9-10 hours for fermenting.